This is a commission slot. You can hire torpedoes42 to create a personalized artwork of this sort here. A semi-realistic look headshot. Human or human-like characters only, please! $25 will get you ONE headshot picture at 800x100px or larger. 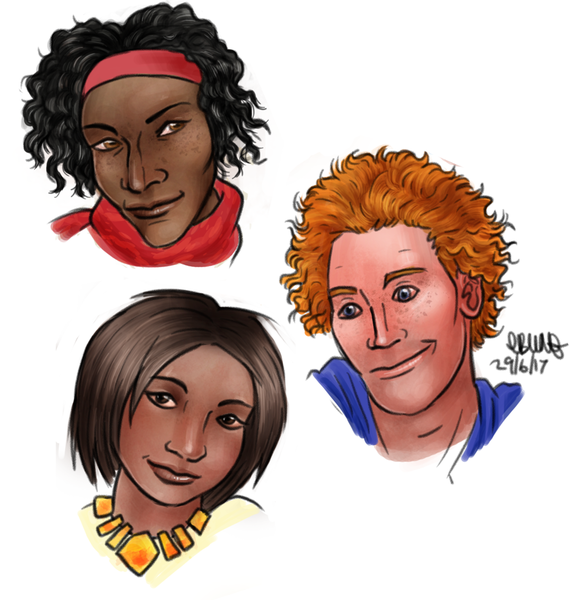 (The three in the preview image is just to show you how different face types will look.) For each additional headshot of the same character, please add $15, or pay a total of $60 for four. For multiple different characters, please start a new job for each one, this will help me to keep things organised. If you want a picture based on a real life person I will need to see a few photos. If you want a pic of a fictional character then I'll need a description, plus if you can find some photos of real people who look roughly similar that will help me nail the look you want. I'll show you a line drawing for you to approve before I go ahead and add the colours. Great drawing skills and very attentive to the client's needs. Would definitely recommend! Beautiful piece of artwork! Just what I was looking for! The artist was wonderful to work with professional and always prompt to reply. On top of providing a final work that was just what I was looking for. Once you receive your commission you can display it wherever you like, either on the web or as a print. You may print it for personal use as much as you like. As a courtesy (but not a requirement) I would appreciate if you would include a link to my blog when you display it online. You must not edit the image without permission. You must not claim that someone other than myself made it. Unless we have a written agreement in place, you must not sell it, or prints of it. You must not use it to advertise other products that you plan to sell. You must not use it for profit. By the same token, I must also agree not to sell the image or use it for profit. I will display it on my website or in my portfolio, unless you request otherwise. If you want to use the image for profit, including posters and merchandise, contact me and we can draw up an agreement. This may incrue additional charges.